Japanese POWs exhume the body of an Allied POW thought to have been killed by the Japanese whilst in captivity. 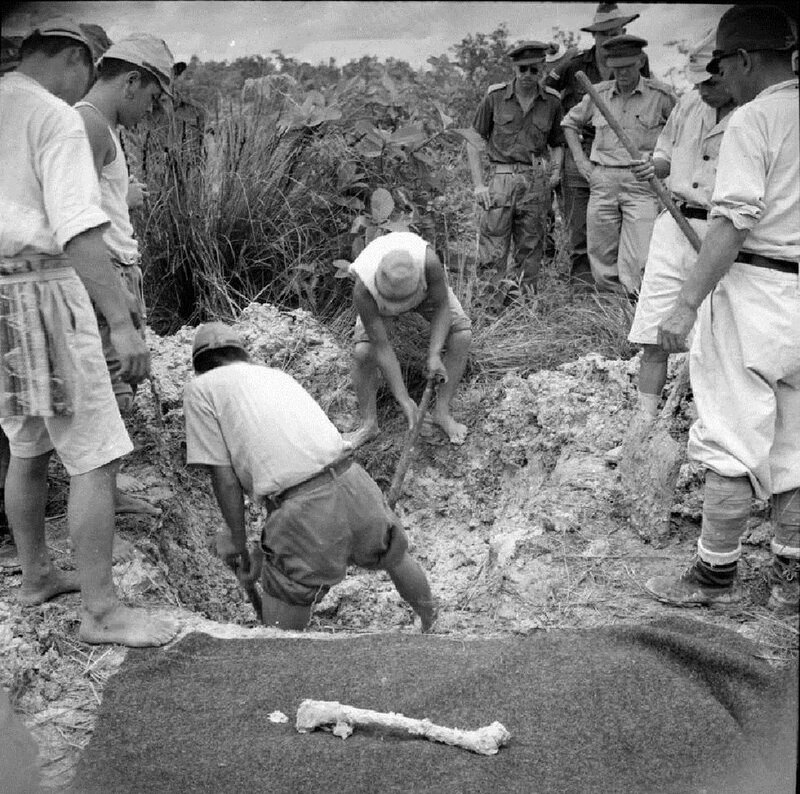 Many exhumations were carried out by a team led by Captain R S Ross of the Royal Army Medical Corps, to collect evidence of Japanese atrocities for the war crimes trials held at Singapore. Image taken by Sergeant Oakes E of the No 9 Army Film & Photographic Unit, courtesy of Imperial War Museums. 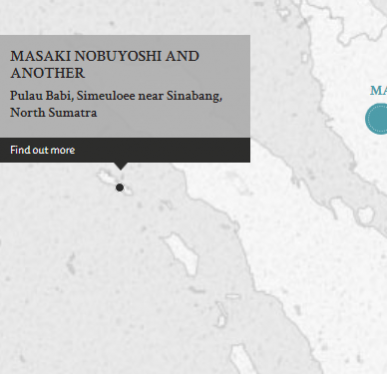 Colonel Masaki Nobuyoshi and Major Honda Akisuke were the military governor of Tanpanuli Residency, North Sumatra and the officer commanding an infantry mopping up detachment operating in that area respectively. At the request and command of Masaki, and over Honda's own protests and objections, Honda executed about 5 or 6 POWs handed over to him by Masaki. The POWs were bayoneted on a small island near Sinabang and their bodies left there unburied, as the ground, being made of coral, was too hard for proper graves to be dug. Though the facts were not really in dispute, both Masaki and Honda disputed their liability. Masaki disputed his liability on the ground that he was merely a messenger passing on an order by the local Kempeitai. Honda disputed liability on the account that he had done all he could to refuse the order, but his objections were overruled and that consequently Japanese military regulations required him to carry out the said orders. Despite the potentially serious consequences if convicted, the trial was a relatively brief affair. The number of witnesses called by both sides was few. The defence had in fact elected not to call any other witnesses other than Masaki and Honda themselves. The accused argued that they were reluctant to execute the POWs in this case. There appeared to be much discussion both by the accused and their subordinates on how to execute the said P.OW.s in a "humane" manner. Furthermore, it was also said that after the execution, a rifle salute, one of the highest forms of respect by a solider, was carried out. Masaki, Nobuyoshi. Colonel. From Japanese military. From Japan. Guilty. Death by hanging. Sentence confirmed. Honda, Akisuke Major. From Japanese military. From Japan. Guilty. 10 years' imprisonment. Sentence confirmed. Barrett, A.L. Lieutenant Colonel. From British military. Solicitor. Court President. Kennedy, J.R.T. Major. From British Indian Army. Wait, R.T. Major. From British military. Lead Counsel. Kunihiro, Minoru. Civilian. Barrister. Supreme Court of Tokyo. Lead Counsel. Healy, J.Y. Captain. From British military.